I’m not a very organised person. This sad fact is becoming more and more obvious to me whenever I attempt to do something in the garden and then have to hunt around for the required tool or equipment. Its only been a few months that I’ve been acquiring gardening tools and things I need in the garden, like organic fertilisers, foliar feeds, secateurs, seeds, pots, gloves etc. etc. And every time I buy something new it gets put in a new / different / available place. So we now have various items I use in the garden scattered all over the garden, garage and inside the house. 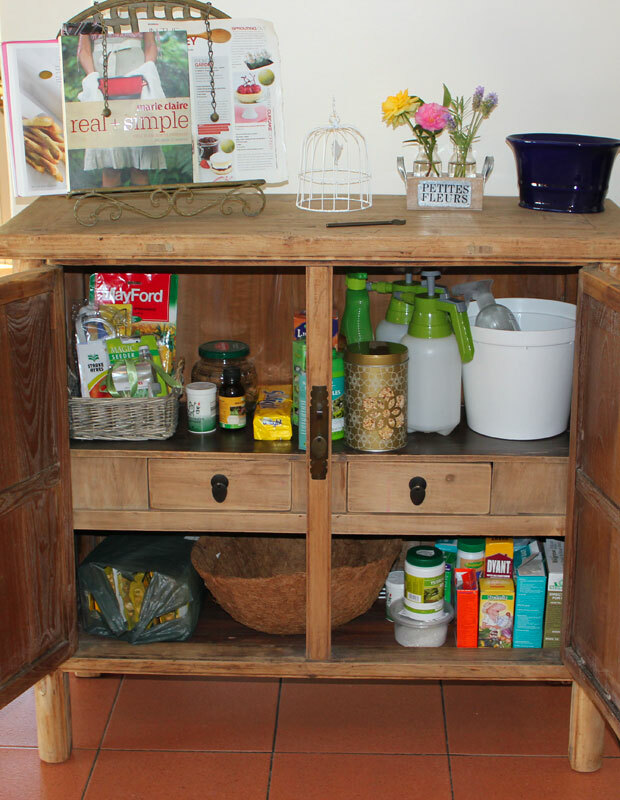 Numerous places have become collection or storage spaces for new gardening things and when I need something I have to go hunting in all those places … its become very annoying – so it was time to “get organised”! 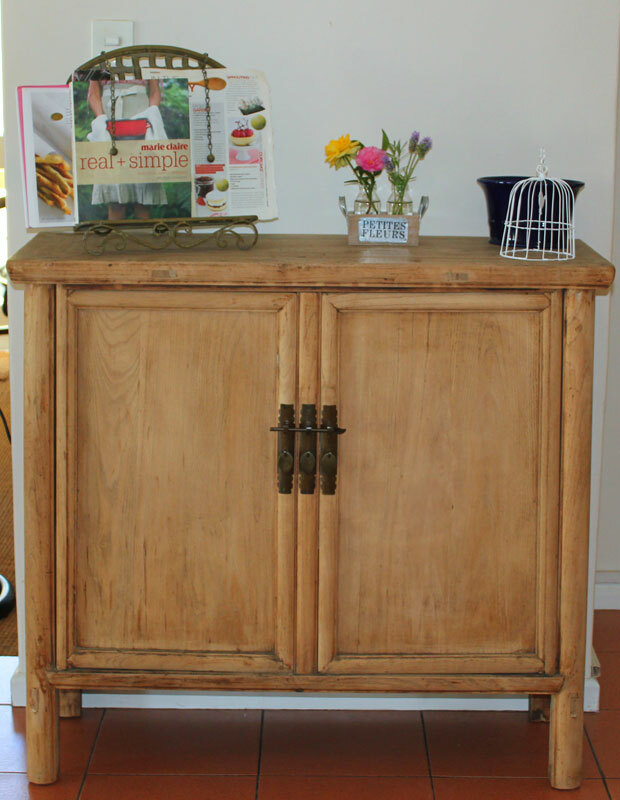 Enter the newest acquisition – an antique Chinese chest! I absolutely love this new chest and I’ve had a great time getting all my indoor things together and arranging them inside the chest. Now all I need to do is put up some shelves on the wall above it for all my gardening books and I’ll look like a Real Gardener! I now keep all the “big” tools in the garage, have one space in the actual garden for outdoorsy type things, and all the small things in this chest. I think it works and I have something beautiful to look at everytime I walk past it! Where do you keep all your “gardening stuff”? And do you think my chest is going to be large enough in the long term? Oh wow!!! What a gorgeous chest! It always makes a huge difference when tools of the trade are in a tidy and organised place. I would not hesitate to do gardening with my stuff so beautifully placed as that! Well done. In my next blog post, I’ll share my so called ‘garden shed’. It will motivate me to get my space organised. Your chest is beautiful! And you look organized. I bet it will be a big help to you. I’m not very organized, either. Most of my stuff (that’s not left out at the moment) is in the garage – somewhere. I do like your Chinese chest. It is a little too nice for my garden supplies. Mine live in steel shelving and milk crates to form a wall of boxes in the garage. I love your new chest. I don’t keep similar items indoor but I have a shelf in the garage and a little garden shed outside. My garage self it not nearly so elegant.